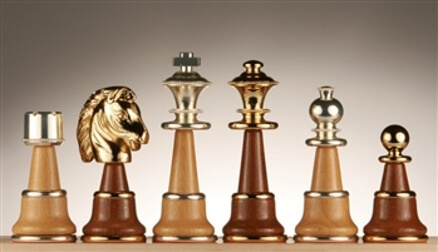 A Brass Chess Set is solid and sometimes a set comes along with a brass-wood combination. Brass chess pieces require a lot of time for completion. Sometimes types of brasses are called bronzes and vice-versa. Brass is used for decoration and for chess pieces because it has a bright gold-like appearance. "What a gorgeous chess set to accompany an equally beautiful chess board. The "whites" of this handsome set are made of maple and adorned with silver plated brass and the "blacks," walnut and 24kt. gold plated brass. These pieces are made in Italy and ready to complete your chess set." A beautiful brass and nickel plated chess set from Manopoulos based on the Roman Empire. The king is represented by Caesar, the queen his wife, and the members of the Roman army are the bishop, knight, and pawn. A Roman column so prevalent in their architecture serves as the rook. 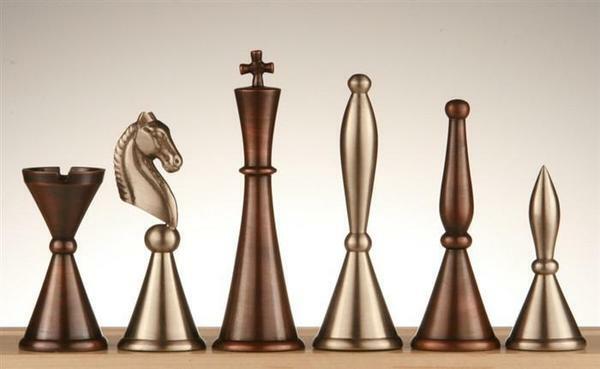 Chess pieces are hand-cast in solid zinc and then brass and nickel plated. Chess pieces are then lacquered to keep the lustrous finish from ever tarnishing.